Running shoes, jeans, outdoor gear, cars, music, drinks, everything has a brand. Everything is a brand. Likewise, in the world of Braai, brands have also been established. Think of a built-in braai, potjie pot, gas, and kettle braai, you think of certain brands. Name a popular built-in braai brand and Megamaster probably comes to mind first. Think of a brand specializing in gas…and Megamaster probably comes to mind again, evident it’s a reputable braai brand. We think of kettle or skottel, we think Weber or Cadac. And both have grown to develop more sophisticated portable braai options. While some built-in braai brands manufacturers diversify in gas, wood, and charcoal options, others concentrate only on wood/charcoal OR gas. There are many brands out there catering for every type of braai enthusiast, such as Chef, Smitties, and ThermoFires, to name a few. A gas built-in braai specialist for thirty-five years, Chad-O-Chef has been manufacturing stainless steel gas braais, initially for the South African market. They are now an ISO-9001 approved, international supplier, who expanded into extractors as well as flueless gas fireplaces with a highly acceptable air clean burning rating. Let’s go back outside to the built-in braai. Chad-O-Chef is the only one on our list specializing solely in gas drop-in braais, gas built-in braai, and gas retro-fit braais. It’s okay to ask – what is a drop-in braai? It’s a gas hob that you can drop into a constructed shell. These pictures will help. Overall, Chad-O-Chef has highly rated, diverse products and accessories for the gas built-in braai. During the mid-eighties, in the little hub of Worcester, HomeFires was born. 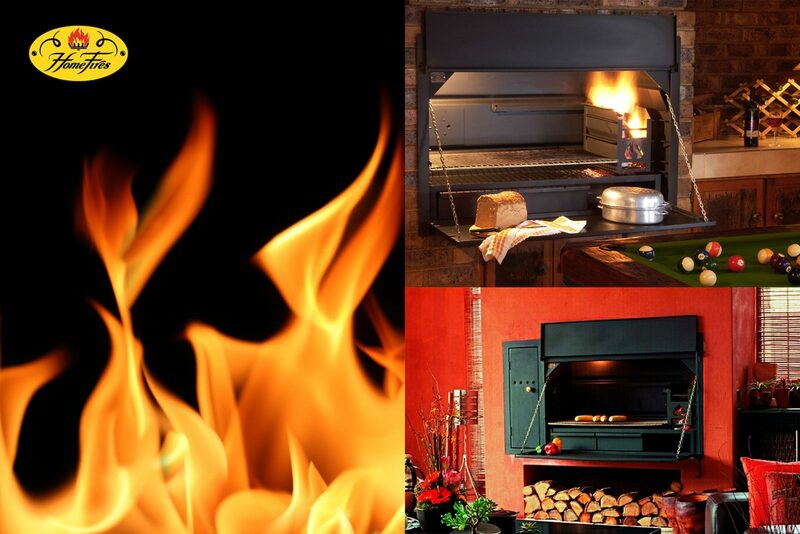 A one-man show that became a market leader in fireplace and braai designs. This is another South African success story that penetrated the export market, yet they still kept things lekker back home by providing exceptional service and products. HomeFires continue to set trends in new patented designs for products being used in smoke-free areas. The HomeFires built-in braai range includes the Econo, Contractor (for property developments), De Luxe, Super De Luxe, and Super Deluxe Spit versions. The last one obviously having everything you need to braai, potjie, roast, and spit for a big fat party. Megamaster has been around since 1997 as a modern built-in braai on steroids. This popular brand supplies a wide range of lifestyle cooking and heating selections. While Megamaster expanded beyond the country’s borders, it also developed partnerships with property contractors to fit out new developments nationally. So, it fast became a mega household name. Besides home heating options using gas or wood or charcoal, Megamaster’s assorted outdoor cooking products offer various built-in braai choices. They have simple, economical, and more stylish selections that come with a heavier price tag but never without the quality. Another success story that started in a garage (Microsoft, Google…). However, this was during the 50s in Johannesburg’s Parktown North. Glynn Jones was the mastermind behind the smokeless fireplace. He didn’t stick to fireplaces and grew to become a major manufacturer of the built-in braai. Now UK-owned and with over sixty years in the industry, you can count on getting your money’s worth, no matter which part of the spectrum you’re spending. This built-in braai range has numerous choices on different levels. The Pro Braai Elite range starts at the lower end, with offerings in the mid and super deluxe ranges as well. Depending on the size, braai skills required, and your pocket, you’re bound to find a built-in braai brand that will tick all the boxes.